Children broaden horizons and mine took me to the Methodist Church hall in eMalahleni (née Witbank). After the ballet exam that occurred therein, the dancers and I looked around for somewhere to celebrate. Googling ‘eMalahleni restaurants’ is a deeply depressing epicurean experience. When the on-line Oracle spat out only a pitiful collection of casino-based chain eateries I put my phone away and headed, on a hunch, towards the old city centre. My theory was that if I could find a sufficiently seedy part of town I would also find a real roadhouse. And I was right. There amidst the panel beating shops and stray cats picking at litter was the Rendezvous. 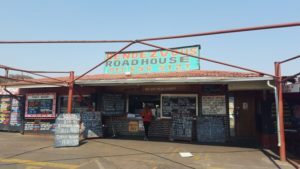 Roadhouses belong to a bygone age. 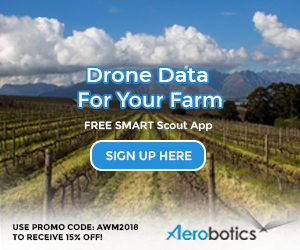 They survive only in small towns and/or unfashionable suburbs, where land prices are cheap enough to justify large lots and the fast-food giants don’t think it’s worth their while to enter the arena. The corner of Walter Sisulu Street and Elizabeth Avenue in eMalahleni is just such a spot. The Rendezvous has probably seen better days. The roof sags slightly in the centre. The splash of neon scrawl announcing its existence blinks and buzzes periodically. A second chalk sign states as follows: ‘RULES: no driving over 20km per hour, no loud music, no fighting’ but even during our late lunch on a Thursday all the above instructions were being ignored. Doef-doef music, revving of engines and alarming acceleration were definitely de rigueur. Double, triple and quadruple starching are also obligatory. My R49.94 beef bunny chow came with plump potatoes and a gravy so replete with cornflour that it was dense enough to stop bullets. 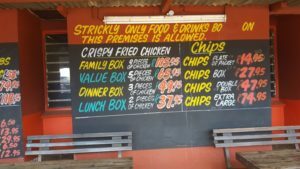 Our charming waitress, Lesego – who arrived immediately every time we flashed the car lights – offered me the option of adding flattened chips to this culinary combo. She explained that these were the Rendezvous’ signature dish. Apparently between triple-frying the chips are pressed flat so as to bring forth extra crunch. And jolly nice they were too. Indian food snobs should know that the bunny’s filling is stew with a sprinkling of Rajah curry powder but that it slips down very agreeably when accompanied by an atomic pink strawberry milkshake. Full marks go to the fried chicken batter maker for a fabulously fragile crust that shattered at the touch of teeth. Inside the flesh was scalding hot and juicy. 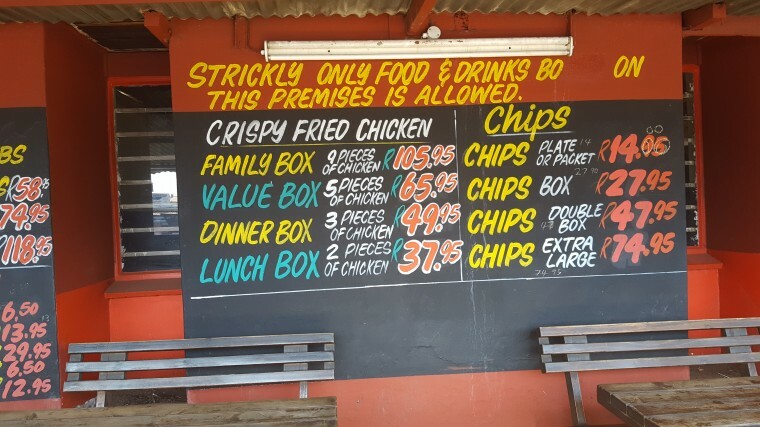 Two pieces of poultry with a mountain of hand-cut, gloriously wonky chips – this portion unflattened for comparative research purposes – set me back the princely sum of R37.95. The laddies (sic) ribs (200g with chips R58.95) were sticky, salty, sweet with a good balance of meat to fat. The menu listed them as pork but the sauce coating was so pervasive that provenance is open to question. It could have been pork but it is impossible to rule out lamb or dachshund. I like lamb and have no particular objection to dachshund. Whatever they were they did the job very creditably. With ribs you want the flesh to come off the bone easily but not fall off. There should be some chewiness and some smokiness. And there was. The fruit-filled, slightly spicy, R25 glass, Four Cousins Dry Red recommended by our waitress was a perfectly pleasant and sensible suggestion. Lesego’s other proposal was to pair the ribs with brandy and coke which would also have worked well. The Rendezvous is about as far from gourmet as you can get but the fried chicken is really good and the ribs are almost certainly not dachshund. The waitress offers serviceable wine pairing advice and it beats oversized muffins and acidic espressos in the casino. 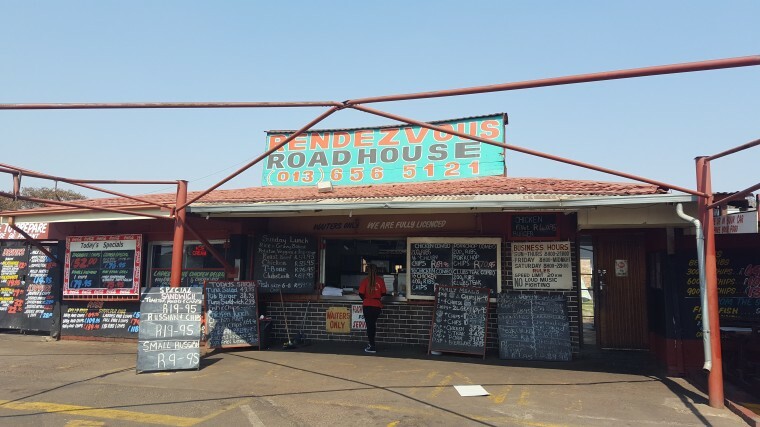 Dear Dr. Anna as a regular vistor of Witbank for business i will buy myself something from this road house in the near future. However please visit Mama Liza next time as your choice to enjoy a better meal in my humble opinion.